We usually ask our featured poets to hang back after their readings to have a short FAQ exchange with the audience. 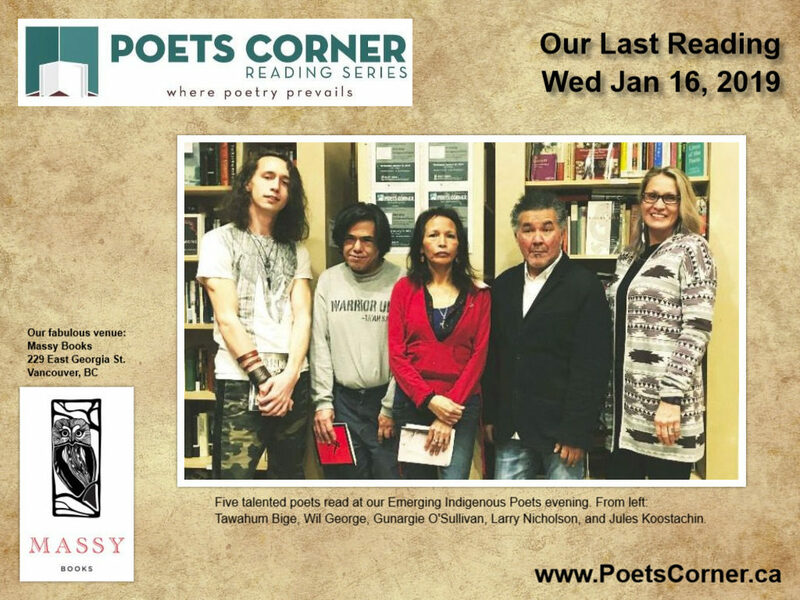 At our last reading of Emerging Indigenous Poets, we asked all five poets to answer any queries people may have had. There wasn’t one question. Instead, there was an outpouring of accolades of just how much audience members enjoyed the work of each poet. With the second standing-room-only event in a row, Tawahum Bige, Wil George, Jules Koostachin, Larry Nicholson and Gunargie O‘Sullivan wowed the crowd with a repertoire of poems that were at times humorous, poignant, politically charged and acutely perceptive. 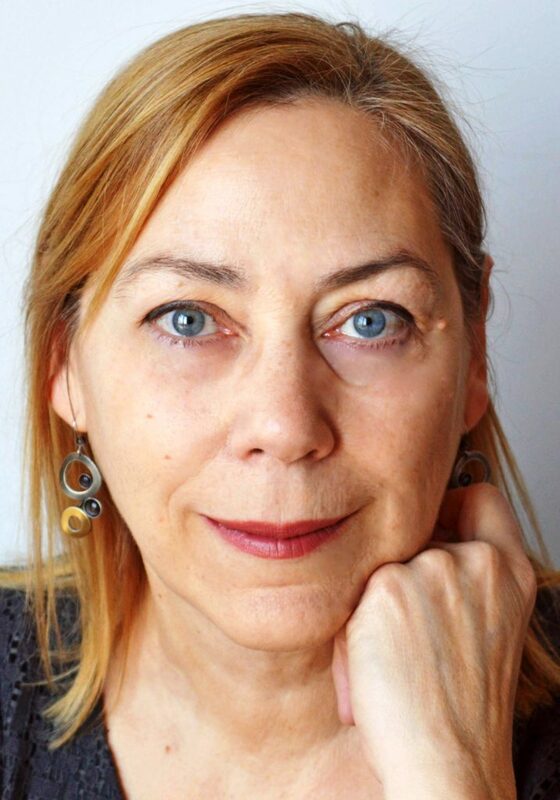 Susan Gillis is a Montreal-based poet, teacher, and editor who has also lived on the Atlantic and Pacific coasts of Canada. A member of the collective, Yoko’s Dogs, she is the author of four poetry collections and several chapbooks, including Volta (2002), which won the A. M. Klein Prize for Poetry, The Rapids (2012), Whisk (with Yoko’s Dogs, 2013) and most recently, Yellow Crane (2018). Susan divides her time between Montreal and rural Ontario, near Perth, where she does most of her writing. Randall Maggs, a writer and a wood craftsman, was born in Vancouver, but has lived for nearly 40 years on the west coast of Newfoundland. 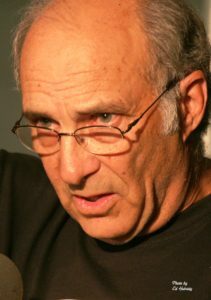 After leaving the Canadian Air Force, he earned graduate degrees in English at Dalhousie and the University of New Brunswick, and in 1977 became a member of the faculty at Sir Wilfred Grenfell College, focusing mainly on Canadian Literature and Creative Writing. He also played an active part in Newfoundland’s March Hare Literary Festival in its 25-year run, acting for ten years as its Artistic Director. As well, he has always been an outdoors enthusiast, skiing and backpacking in the high country of Western Newfoundland. His last book, a collection of poetry entitled Night Work: The Sawchuk Poems, was a Globe and Mail “Top 100 Book” in 2008 and won the Winterset Award, the Pratt Poetry Prize, and the Kobzar Literary Award. In 2018, Brick Books brought out an enhanced ten-year anniversary edition of Night Work in anticipation of the release of a feature length film based on that work. Produced by Blue Ice Pictures, the film is to be releasedinthe spring of 2019. Leslie Timmins is the author of the chapbook The Limits of Windows (The Alfred Gustav Press, 2014) and Every Shameless Ray (Inanna Publications, 2018). 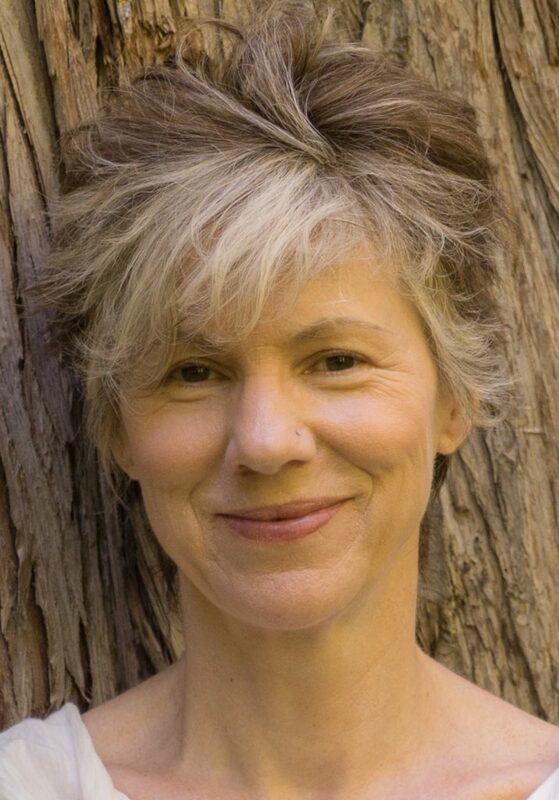 Shortlisted for the Montreal International Poetry Prize, winning honours in magazines in Canada and the United States, and published in numerous magazines and anthologies, her poems are strongly influenced by the years she spent living in Europe and the Canadian Rockies, as well as by activism and a decades-long Vipassana (insight) meditation practice. She currently works as an editor, volunteers with the Women Refugees Advocacy Project, and is a member of the powerful powerX6 writing collective. 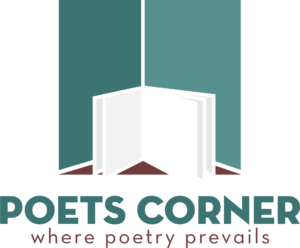 Because we have three featured poets for February’s reading, the Open Mic segment will be shorter than usual. We have a commitment to a few who couldn’t get on the list at the last reading, so if these individuals show up, they will get the first opportunity to present.